On January 31, we’ll get the third supermoon in a row, which will also be the second full moon of January and coincide with a total lunar eclipse. These celestial phenomena aren’t actually that dramatic on their own, but their alignment is a pretty cool reason to look at the sky. It’s not often that you get to say a “super blue blood moon” is coming. But that’s exactly what we’ll get on January 31, for the first time in more than 150 years. For the first time since March 31, 1866, we’ll have a total lunar eclipse that happens during the second full moon of a calendar month and also happens to occur when the full moon is near the point of its orbit that brings it closer to Earth. That’s a blood moon, a blue moon, and a supermoon all at once. But know that these names can make an event like this sound more dramatic than it appears – it won’t be anything like the total solar eclipse of 2017. Unless you are a regular moon-watcher, you may not notice anything different about this full moon. Yet the remarkable alignment of events should nonetheless serve as a reminder to look up in the the sky and observe our planet’s satellite. “Sometimes the celestial rhythms sync up just right to wow us,” a NASA post explains. A supermoon is for many astronomers a controversial term. 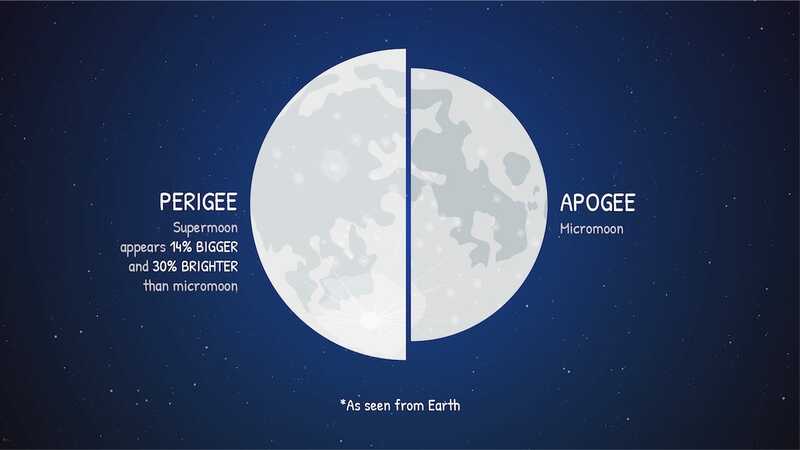 Supermoons occur when we get a full moon near or at the point when the moon’s orbit is closest to Earth, also called the perigee of its orbit (the technical term for the event is really perigee-syzygy). NASA/JPL-CaltechIt’s nearly impossible to compare the apparent size of the supermoon with a micromoon from memory, but when seen side-by-side as in this graphic, it becomes clear. The commonly used definition of a supermoon is any full moon that falls within the 90% of the lunar orbit closest to Earth. By that criteria, we should get a cycle of several supermoons about every 14 full moons. This upcoming supermoon is the third in a trilogy – the brightest was the recent January 1 supermoon. Another trio comes in 2019. The term blue moon has to do with frequency, and not, unfortunately, appearance. The moon rotates around the Earth every 27.322 days, and we get a new full moon approximately every 29.5 days (those numbers don’t match exactly due to elliptical orbits). There are traditional names like “wolf” or “harvest” for the first full moon of a month each year. But since it’s rare to get a second full moon in a month, that moon doesn’t have a name, making it a “blue moon.” This usually happens about every 2.7 years, though because February has only 28 days, a number of regions will get another blue moon in March 2018. The coolest thing to look for on January 31 will be the total lunar eclipse, when the moon lines up with the Earth and sun so that the sun’s light, which normally shines off the moon, is blocked by our planet. This happens at least twice a year – but in this case, it’s the fact that all these events coincide that makes it so cool. Because of the timing, you’ll need to look at the right moment on the 31st. The partial eclipse begins 11:48 Universal Time (UT), and the total eclipse begins at 12:52 UT and reaches it’s maximum at 13:30 UT. For those in the Eastern Time zone, that means the partial eclipse begins at 6:48 a.m., while people in the middle of the country can catch the total eclipse beginning at 6:52 am Central Time.